This is the most up to date, complete and concise publication on the colors of change. It is written for both practitioners and academics that want to go beyond the basics. Those who already know about this change theory are likely to be surprised to find there is more to both the model and its applications. It is the draft version of a chapter for the reputable ROCD book series. The colors of change is an overview of change paradigms, created about two decades ago, that has been intensively used, tested, refined, shared, and elaborated by practitioners and academics alike. Here, the “color theory” is presented as it is now, and is situated within the literature. Its four main applications are described as well as rules of thumb that have been derived from reflective practice. The text illustrates that the color theory is clearly not one thing to all people, as it is understood in very different ways, both in terms of its theoretical foundations as well as the complexity of its applications. This probably adds to the versatility of the theory. Bringing together key insights about the color theory for academics and practitioners, this chapter strives both to give a concise overview and to explore its richness. Research in Organizational Change and Development is a book series that tries to capture what’s best in organization development. One new book comes out each year, going back 26 years. 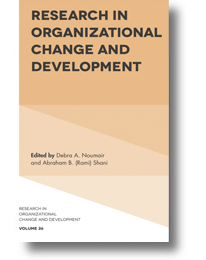 It tries to bring forth the latest scholarly work and practice in the fields of organization development and organizational change. Its objectives are to highlight the latest advances in thought, ideally supported by research and practice. They also endeavor to make the series a resource to scholars who are interested in well-integrated reviews of the literature, advances in research methods, and ideas about practice that open new ways of working with organizations to create more successful and sustainable approaches to change. It editors the last years have been Rami Shani and Debra Noumair.